The time has never been better to build a thriving business on Amazon Web Services (AWS). Moving to the AWS cloud provides companies with more agility, elasticity, cost savings, and the ability to expand their business footprint while developing a global reach to customers. AWS Partner Network (APN) Partners have the opportunity to see a 6X – 11X+ multiplier uplift over AWS spend when delivering a comprehensive suite of value-added services to customers. In this post, I will give APN Consulting Partners an overview of why specializing in Desktop and Application Streaming Services helps customers who are looking to migrate to AWS. We will explore some of the offerings APN Consulting Partners can build into their practice. We recommend you take a solutions-based approach to building your specialized practice by following AWS building blocks and providing holistic solutions and services that customers need. This can be the most critical offering to customers, as it provides the expertise and experience on how customers can optimize their environment for cost, features functionality, and operations. This is the initial conversation regarding the benefits of desktop and application streaming solutions. A workshop covers the effort and skills required to manage the solution compared to traditional desktop deployments, cost modeling for device replacement, and licensing. Other topics to cover may include putting value behind the benefits of centralized security and compliance, enabling a mobile workforce, and extending the life of legacy applications. To learn more about this transformation, check out the AWS re:Invent session Hamster Wheel or Workspace Transformation. You can also learn about cloud migration business drivers. Typically, APN Consulting Partners provide a general architectural assessment workshop where a review of the entire environment is performed, application by application. It’s important to include desktop application components when doing these assessments. A common objective of the workshop is to create user personas where customers outline their users’ objectives and categorize them into use cases, such as office productivity users, 3D application users, developers, and call centers. Each category has a set of functional requirements to complete the objectives required of the end user. Level of security and compliance required, criticality, and management of the end point. Integration points and dependencies of the desktop application. This includes support for client device types, client peripherals, Windows user profile management, hosted desktop deployment types, hosted desktop operating system (OS) types, application management tools, and configuration management tools. Application load metrics to help understand the scale of the infrastructure required to support the environment. These metrics include compute, networking, storage, and Graphics Processing Unit (GPU) support. Tools can be used to quantify these metrics and give recommendations on required desktop resources for each use case. Once the requirements, objectives, and categories are defined, a solutions architect can map the use cases to a technical solution. This workshop also aligns each application to a migration pattern. Once each application has been assessed, they can be aligned to a migration pattern. Learn more about the 6 Common Application Migration Strategies. APN Consulting Partners should have a plan to migrate all of the dependencies of the desktop application and the typical migration strategies for desktop applications are listed below. If the customer has an existing VDI/application streaming solution, they can also look at the migration patterns of that solution. For customers migrating off fat client desktops or with existing VDI/application streaming solutions who want to migrate within a short amount of time, rehost may be the right choice. Partners can recommend a direct export of the desktop image onto AWS or, if possible, install the applications into an Amazon Machine Image (AMI). Fat client migration customer will need to look into which VDI/application streaming solution works best for their use case. Similar to rehost, but Partners can make optimizations to the environment during the migration. This could include configuring the VDI/application streaming solutions to make use of advanced features like auto scaling of resources, moving application databases to Amazon Relational Database Service (Amazon RDS), or to make use of application layering, isolation, user profile management and/or user data management tools. This pattern offers options outside using the desktop application and streaming solution. For example, the desktop application vendor might have a software as a service (SaaS) offering that meets the customer’s needs. If the desktop application is still needed, the customer may look at moving to a different VDI/application streaming solution that better matches their needs. Some considerations include, cost, ease of use, and feature set. This pattern is similar to repurchase, but with custom in-house applications. The customer could re-write the software to a micro services/web-based application where a desktop application is no longer required. This option can have a high upfront cost but provide end users with a better overall experience and future-proof the application. APN Consulting Partners can assist customers in implementing the design of their environment on AWS, giving customers a worry-free development, integration, and migration of desktop applications to AWS. A proof of concept (POC) validates that a solution meets a set of technical requirements that are outlined within the Desktop Application Portfolio Discovery Workshop. A pilot validates user acceptance of the solution and can also validate performance testing metrics required to properly scale a solution. Before engaging stakeholders in these activities, success criteria and the tools required must be identified. At this point, design has been completed and project management can take over to work with the implementation engineers. Application owners and infrastructure owners are also needed. The application owners will validate the operation of the deployment, and the outcome will include documentation of any deviations of the deployment and a handoff to operations. Managed Services offerings provide resources for the operational tasks required to maintain a solution. It’s important to define the roles, risks, and shared responsibility of the environment. These solutions can provide management of the VDI/application streaming solution and/or management of the desktop image and resources. Managed Services of the VDI/application streaming solution tasks include changes in provisioning of resources to users and upkeep of the deployment. Managed Services of the desktop image tasks include, management of the user profile, application packages, and OS image layers. This includes updates, patching, and configuration changes of each layer. Since this kind of service offering provides a completely managed infrastructure, it’s also possible to support entry-level end user support calls for the proper use of the desktop applications or end point device management. As APN Consulting Partners work with customers, common architectural patterns will start to arise. Automation is important to streamline these activities. 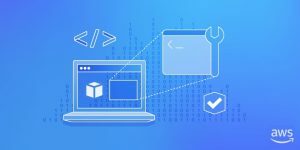 AWS CloudFormation templates, Chef, Puppet, or other configuration management tools are a way of automating common customer architectural patterns. Some customers require additional provisioning portals outside what the control plane is able to offer. These provisioning portals typically integrate via an API to the VDI/desktop application streaming solution and service catalog solutions such as ServiceNow, AWS, and other components of the infrastructure. Now that you are familiar with some of the consulting service offerings for desktop and application streaming solutions, check out Amazon WorkSpaces and Amazon AppStream2. They are desktop and application streaming solutions from AWS that are turnkey solutions for a wide range of use cases. You can also check some of our APN Partner solutions and environment management tools in this APN Blog post. For example, VMware just announced the support for Horizon 7 on VMware Cloud on AWS. Architecturally, the Horizon 7 platform is the same on-premises as it is on VMware Cloud on AWS, so the deployment and management experience stays consistent across environments. APN Consulting Partners should train and educate their engineers for the solutions that run on AWS and fit the needs of their customers. Since these solutions can vary greatly on the features and use cases available to customers, APN Partners need to be well-versed on a handful of solutions and have deep expertise in a choice few.